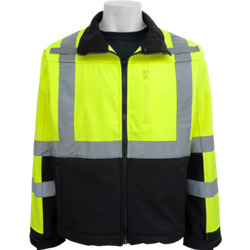 FrogWear® HV - This breathable, premium soft shell jacket is windproof, water resistant and ANSI class 3 rated. It provides great protection from weather in lightweight, durable form. It also features a black bottom and silver reflective material for a clean, highly visible appearance. Two front lower pockets left breast pocket, and three inside pockets. The waist and wrist cuffs are both adjustable.